Ransom Riggs’ first novel has many attractive features for a fantasy: initial mystery (exactly what did Jacob’s grandfather do on his ‘hunting trips’? ), the increasing appearance of magic (the incredible powers of individuals, travel elsewhere in time and space through a portal) and menacing monsters (what exactly are wights and hollowghasts?). After a slow start the story’s pacing then starts to grip the reader and, as opposed to novels where it isn’t clear till the final few pages, here there is a clear sense of a beginning of a promising series. But is the plot driver really only a random-ish selection and sequencing of weird photos, however unexpected they may be? I’ve generally avoided reviews and discussion of this book and so I don’t know if what I’m about to say is already known; nor do I know if my theory is, however plausible, way wide of the mark or merely coincidence. But I offer it as a chance to look aslant at the story, through half-closed eyes as it were, and that by throwing light on the novel from a different angle new aspects may be revealed. 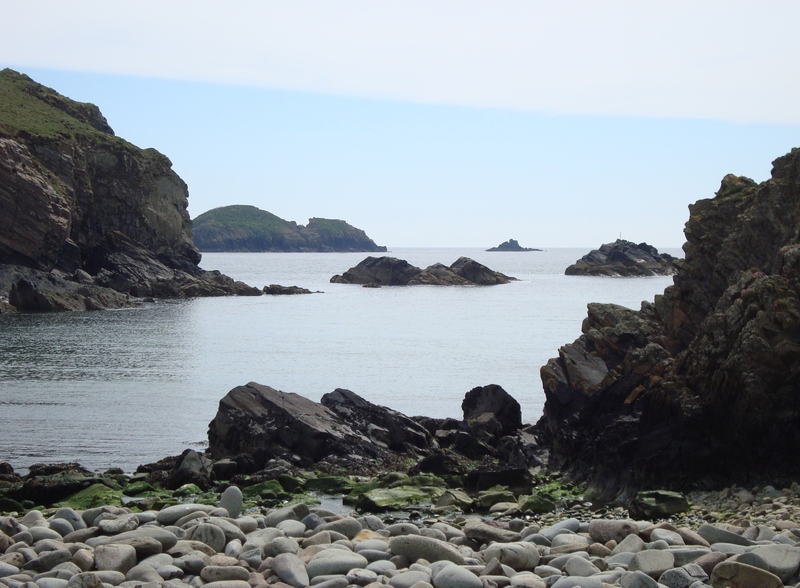 Ten years of living in West Wales made me curious about the island of Cairnholm, site of a small fishing community and Miss Peregrine’s Home. ‘Holm’ is a common name for an offshore island around the coast of Wales, a legacy of Viking raids and settlement around a millennium or so ago; the ‘cairn’ element refers to a Neolithic burial mound which dominates one end of the island. We know from a preview of the book’s sequel included in the paperback edition that ‘Cairnholm’ is around nine kilometres — five or so miles — from the mainland. Is there a real Welsh island that could have been the model for Cairnholm? After Anglesey and its satellite Holy Island off the coast of North Wales, the third largest Welsh island is Skomer, separated from the Pembrokeshire mainland by a deep channel. It’s a ornithological paradise, and in season includes thousands of pairs of nesting seabirds — including the Manx shearwater that Jacob’s father gets excited about when he spots it. About 2 miles by 1½ miles in size, it’s possible to conceive this as Cairnholm even if there’s no fishing village here, just a farmhouse and some holiday cottages. The problem is that it’s no real distance from the mainland. However, about ten kilometres (six miles) to the west of Skomer is the island of Grassholm, in Welsh Ynys Gwales. Essentially this is a giant uninhabited rock largely covered in gannet guano, and doesn’t seem at first a likely contender. But Ynys Gwales has a long mythological history as the location of a mystery island. 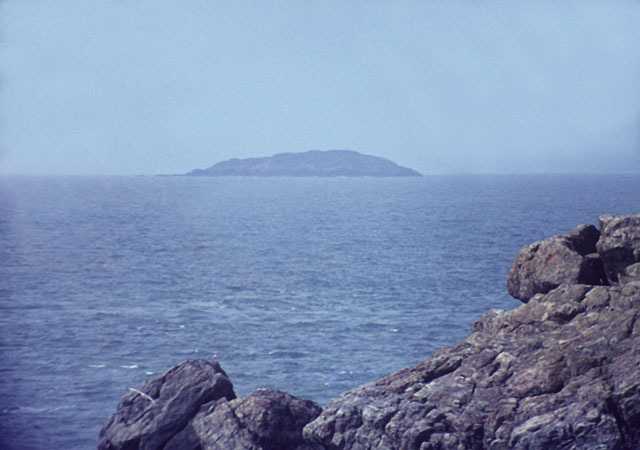 At the end of the 19th century a sea captain reported an island floating a little below the surface of the sea in the vicinity of Grassholm; earlier in that century mainland folk claimed they could on occasion see Fairy Islands a short distance off the coast, supposedly densely populated with fairies; and Victorian scholar John Rhys suggested that a phantom Pembrokeshire island inhabited by ‘the Children of Rhys Ddwfn’ (Plant Rhys Ddwfn) was really a fairy island, as these folk were properly Plant yr Is-Ddwfn, that is, ‘the Children of the Underworld’. The oldest identification of this island with Grassholm or Ynys Gwales was in the Medieval Welsh tale of Branwen the Daughter of Llyr. Is this the conscious template for Ransom Riggs’ story? Maybe, or maybe not; only the author knows. Either way it provides a narrative depth for the novel that I find very satisfying, in a way that a selection of odd vintage photos, however artfully incorporated, does not. Does this putative blueprint detract from the book’s originality? I don’t think so, as it is the imaginative use and combination of apparently commonplace motifs that can make a novel truly novel. And on that basis, Miss Peregrine’s Home for Peculiar Children — despite a few flaws, mostly culture-specific — is a ‘novel’ novel. The novelty is certainly evident. A challenging approach which must have contained some risk of going awry. Using pictures to construct a story is not difficult, but the manner in which it’s done is key to its success. There was a Stephen Poliakoff TV drama, Shooting the Past, which used many archival photos to construct a fictional mystery for the narrative, and which not only worked for me but was a critical hit. The Calvino tale using Tarot imagery however I found harder going, only getting halfway through before temporarily putting it aside. And there have been endless novels of course taking a painting as a jumping-off point — The Girl with a Pearl Earring being a well-known example. Don’t all authors begin their stories on a montage of vivid images and incidents? I’m sure you do, Col! Intriguing systems, but I’m not sure I could bring it off. What works for me, in some weird way, is to start with a protagonist, who then starts doing or experiencing something which adds other characters as well as the montages. I feel quite guilty when praised for meticulous plotting – the stories plot themselves during the writing, and constantly take me by surprise. However, rarely do I need to adjust anything which proves to be out of sync with what has followed. Starting with a protagonist is not weird at all, I’ve read of several authors whose main character suddenly pops into their head either demanding a story be written around them or somehow dictating the course of events. It’s certainly an intriguing premise for a story, Sue, and I’m already wondering how he keeps it fresh for the sequels. I keep noting more parallels between Riggs’ novel and those old Welsh tales, Sue. For example, Miss Peregrine and her mentor Miss Avocet have bird names, as do other individuals who don’t appear in the story. They remind me of three mythical birds who, in the same tale of Branwen I mentioned in the review, sing to the surviving warriors and the head of Bran when they’re at Harlech (you remember Harlech, Sue, the castle you’ve yet to visit!). The sweet songs of all the birds in the world are said to be coarse compared to the singing of these three birds. In another Welsh medieval tale Culhwch and Olwen these birds are specifically identified as the Birds of Rhiannon, “the ones that rouse the dead and make the living sleep” — perhaps a reference to powers that Miss Peregrine and her ilk might have in the sequel to this novel. I wasn’t impressed by Rigg’s work, but you give it a valuable spin, Chris. I have to put in a word for WG Sebald, who used found photos to illustrate his novels dating from the 1990s. Reading Sebald, I always wonder which came first (photos or story), but his stories are so fascinating, his writing is so gorgeous and some of the photos so specific (e.g., silkworms, Roger Casement, erupting Vesuvius) that I suspect the two weave together in a way that even Sebald himself couldn’t separate. Sebald’s works are on my desert island books list. My advice, Chris: start with The Immigrants, move next to Austerlitz, and end with Rings of Saturn. The third is my favorite, but I’d love to know what you think of any of them. Thanks for your recommendations, Lizzie — I’ve a strong feeling you’ve reviewed one or more of these titles as the last two sound familiar, if so I must look them up (again). The way Sebalds includes pictures in his writing, and follows different tropes… I believe you might appreciate him. Great article Chris – I’ve just finished the book and this has given it a much needed new dimension. Felt overall it was a novel too much in search of a film deal (and sequel) to be really interesting, although the constituent parts were all there. I’m much in agreement with you, Jake; I’m not arguing this is a great book — too many narrative commonplaces, certainly, and the speech of Cairnholm’s townspeople bore no trace of Welshness about it but a lot of cliche swearing and not a few Americanisms — but it’s not a bad book either. Film options? No, I wouldn’t be surprised. I enjoyed this, but I did feel it lost focus, and the comment above about constituent parts hit the spot for me. It just felt a bit manufactured. I’m pleased it did get a film deal, because it is original, but I wonder how much the film will capture of that originality, and the real sadness at its heart. Not naff at all, Lynne, it’s not a great piece of literature and I’m sure you’ll have better things to do! Even if you don’t read the book though have a look at a copy in a library or bookshop just to see the vintage photos that inspired it, they really are peculiar. Wonderful that an Italian railway station should carry books in English. Can you imagine London’s Waterloo stocking Italian or any other foreign language books in their WH Smith’s? Watched the film but haven’t read the book, though I really loved the premise. I like the idea of basing a story on photos – I too remember Shooting the Past and it was brilliant! – and Anthony Horowitz has based his latest novel on someone following the clues in an unfinished novel, which kind of sounds like fiction eating itself but intrigues nonetheless. What did you think of the film, Lynn? Seems, from the trailer, typical Tim Burton, but I would have liked a bit more of a Gothick feel, maybe sepia-tinged for the Home (in the manner of the swap from monochrome to technicolor when Dorothy goes to the Land of Oz). Still, I like the metafictional touches that films and fiction sometimes incorporate in their medium. Glad you liked the stuff about Welsh islands and mythology — would be nice if the author had unconsciously picked up on those parallels, a bit like Rupert Sheldrake’s ‘morphic resonance’ where ideas seemingly get picked up independently out of the ether, as it were! Burton has vision, I feel, but a lack of powerful finish seems to be his Achilles heel. Yes, I think you’re right. He’s very creative but many of his recent films have spluttered to a halt. Thanks so much, glad you found it of worth! I’ve not read the book yet, but my 16-yr-old daughter loved it. We went to see the film – and it started off well, but diverged from the book so much with a whole different ending that she was disappointed. I thought Eva Green is rather wonderful as Miss Peregrine, and the others in the all-star cast are underused in their cameos (Judi Dench, Chris O’Dowd, Samuel L Jackson, Rupert Everett, Trevor Stamp). The kids were mostly great. Jacob’s dad (O’Dowd) is an ornithologist in the film, so that fits those islands well (plus gives scope for Hitchcock references etc). As this is the first title in a trilogy, Annabel, it may be that those underused luvvies will reappear in the film sequels (if this does better at the box office than, say, The Golden Compass did, the screen adaptation of Philip Pullman’s Northern Lights). Probably best, I suppose, not to compare film and book — the former is rarely up to the standard of the latter — and just take it on its own merits which, from your comments, are not lacking! The Golden Compass film tanked didn’t it – although I heard wonderful things about the stage adaptation of Northern Lights (wish I could have seen that). The Miss P film lost its way when it tacked on the different ending which descended into pure Doctor Who, but anything Tim Burton does is interesting … Daughter is now reading and enjoying Book 2. I’m looking forward with high hopes to the upcoming BBC Wales adaptation of Northern Lights as a serial, I think, will allow the story to develop a little more. Missed the much-praised stage version too, like you. You’re, as ever, welcome, Paula, I couldn’t not include this fantasy set just off the coast of my former stamping ground in Dewithon19! Hmmm. As others have said, this is a story that’s got tons of promise, but also some “meh” in it that keeps me from diving in. I saw enough snippets of the film to not really care about seeing more of it, but at the same time I can certainly appreciate what draws people to these stories. I suppose I feel the same about A Series of Unfortunate Events; many have recommended it to me, and someone did show me the film. I dig some of its elements, but the characters just don’t engage me enough to pull myself into the pages. On the flip side, I recently had the film “Mortal Engines” on while grading; while the film had some issues, I was really engaged by what I saw in the story and would now like to read the series by Phillip Reeve. That, and the film’s opening sequence had me giggling because I couldn’t stop thinking about that opening sequence in Monty Python and the Meaning of Life–those pirate accountants are awesome. Wow, this is random. 🙂 Hope you’re having a great day! Absolutely no need to chastise yourself, Jean, these are some of the most coherent ‘random’ comments I’ve seen from anyone! Just back from a two hour walk in spring sunshine (banks of a river, through a private country estate and along a canal) and so very grateful we don’t have snow as you have done! Tim Burton’s film adaptations are pretty hit and miss — the production beautiful but a genuine emotional depth often missing (his Dumbo has been severely mauled by critics here, for example). I’ve yet to see Mortal Engines and suspect some punches have been pulled (Heather’s disfigurement, for starters) but I am looking forward to seeing it eventually. I know from the trailers what you mean by the pirate accountants parallel though! Caveats aside, I’ve got Ransom Riggs’ collection of fairytales set in the Peculiar Children’s universe to read, possibly for the May Wyrd & Wonder event. If that disappoints I may well give up on his stuff altogether! The snow’s gone already! That’s rather normal for us this time of year–snowfall one day will melt the next. But there’s spots in Minnesota just a few hours away that have been pounded with several feet of snow. It doesn’t help Biff keeps insisting on wearing snow pants to school because the wind’s super-raw. I checked, and it’s Hester in the film as well as the books (perhaps a reference to her stellar qualities?). I know the film got panned overall and lost money, but I’m keen to see how faithful it is to the original when it makes it onto DVD or terrestrial TV. I liked Keaton as Batman, but even more as the eponymous Birdman. As for Burton, his first Batman foray wasn’t bad, but I preferred his Edward Scissorhands movie and The Nightmare Before Christmas as examples of what he is best at, creating original masterpieces rather than rehashes or pastiches. Don’t forget Beetlejuice! We just had that one on the other day. But that’s quite true–he had some beautifully dark stories in him, but once he moved into adaptations those films have vanished. After all, Nightmare’s now…twenty years old? Not to mention he’s been under Disney’s heels now for at least ten years. What the heck does Disney have on him to keep him leashed up? No, hadn’t forgotten Beetlejuice, but not seen it since a year or two after it first came out! I’m amazed my folks let us watch it! Though honestly, I don’t remember anything in this really scaring me, not when we had movies like Return to Oz and Neverending Story traumatizing me with the hallway of screaming heads, a horse swallowed alive by quicksand, etc.